What’s The Most You Could Save In Tax Advantaged Accounts? When you think about it, the government allows you to put a ton of money into tax-advantaged accounts. You just wouldn’t know it at first glance. Technically, a traditional or Roth IRA is the only tax-advantaged account that every working person in the US has access to. As of 2018, the max contribution per person to those accounts is $5,500 per year. It’s a start, but someone saving only $5,500 per year will be saving for a long, long time. Luckily, there are a ton more ways to save in tax-advantaged accounts beyond just the IRA. You just need to think about what you need to do in order to gain access to the additional tax-advantaged space. Admittedly, it takes a lot of work and some unique working situations in order to put away a ridiculous amount of money in this manner. Still, most people with totally normal working situations should be able to save much more than they probably think. This post will take a look at just how much someone could potentially save into tax-advantaged accounts. Since we’re about reaching financial independence here, I’m going to assume, for purposes of this article, that everyone is under 50 years old. The government, being the nice folks that they are, let you sock away a little bit more money when you get older. ut if you’re reading this and you’re younger, hopefully, you’ll be in a position where you don’t even need to save money when you’re older. Thus, the over 50 catch up contributions won’t even matter anyway. Most people in traditional jobs assume that they have access to only two types of retirement accounts – a 401k and a traditional or Roth IRA. Let’s take a closer look at these two accounts. The majority of you reading this are probably traditional employees with access to a 401k or 403b at work. The 401k is typically provided by your normal, private employer. The 403b is the same thing and typically comes in the non-profit sector. Almost anyone working a professional job will have access to one of these two types of accounts. As of 2018, the max you can contribute per year is $18,500. Note that the maximum is $18,500 between all of your 401ks and 403bs. In other words, if you leave your job and happen to have two 401ks during the year, your total yearly max contribution is still $18,500 between all of your accounts. $18,500 in tax-advantaged savings is a decent start, but it’s not enough if you’re making a good salary and aiming for financial independence. Instead, we’re going to need to add a little bit more savings into our tax-advantaged pot. Every single person reading this will have access to a traditional or Roth IRA unless, for some reason, you have no earned income for the year. 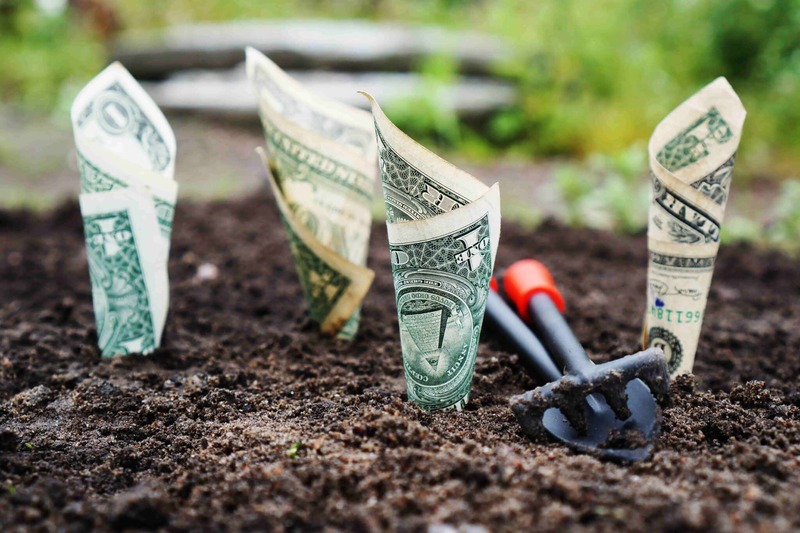 Since basically all of us probably have to work a job, it’s safe to assume that you can throw some of your hard earned income into a traditional or Roth IRA. Some basic vocabulary might be handy here. You contribute to a traditional IRA with pre-tax dollars. You’ll pay ordinary income taxes when you withdraw it. In contrast, you contribute to a Roth IRA with post-tax dollars. In that situation, you’ll pay taxes on your contributions up front and then you’ll never pay taxes on those dollars again. I’d typically recommend contributing to the Roth IRA over the traditional if you expect your income to be pretty high in the future. If you’re already making a high income, you won’t be able to contribute to a traditional IRA anyway (or at least you won’t get a tax deduction for your contributions). And if you expect to make a high income later, you’ll want to make sure that all of your traditional IRA space remains empty in order to give yourself the ability to utilize a backdoor Roth IRA in the future. If you take advantage of both of these standard accounts, you’ll be doing way better than most. With the $18,500 from your 401k or 403b, plus the $5,500 from your Roth IRA, you’re now sitting on $24,000 in tax-advantaged savings. Still good, but let’s see if we can get a little bit more. I’ve written in the past about how the HSA is the perfect tax advantaged account for millennials. If you want to be able to contribute to the HSA, you’ll need to make sure that you’re signed up for a high-deductible health plan. It’s the only way to gain access to this tax advantaged space. Most millennials aren’t going to the doctor very often anyway, so it doesn’t make much sense to pay higher premiums for something that we’re probably never going to use. With the HSA in tow, we’re snagging ourselves another $3,450 of tax-advantaged savings. With the $18,500 from the 401k or 403b, plus $5,500 from the Roth IRA, plus $3,450 from the HSA, we’re now sitting at $27,450 per year of tax-advantaged savings. The majority of people should be able to contribute to all three of these initial tax advantaged accounts without having to do anything special beyond signing up for a high-deductible health plan. If you a think about it, your typical married couple with both people working should be able to put away well over $50,000 per year in tax advantaged savings. That’s pretty incredible to think that almost everyone can potentially save the median household income in tax advantaged accounts every single year. But if you’re in a unique position, maybe you can save a little bit more. One of the pleasant surprises I discovered when I made the switch over to government work was that I gained access to a 457 plan. I’d never heard of this plan before I started my new gig. The 457 is basically the same as a 401k or a 403b. It’s provided to you through your employer and any money you contribute to it is done on a pre-tax basis. Typically, only government employees have access to this type of account. There are two key things about this account that make it amazing. First, unlike a 401k or 403b, the 457 has no early withdrawal penalty. You read that right. You can’t withdraw the money while you’re working for your employer, but once you leave your job, you’re allowed to pull money out of the 457 account just as if it were any other taxable investment account. This is an amazing benefit for anyone pursuing early retirement. Second – and a huge benefit for super savers out there – the 457 has a completely separate contribution limit from a 401k or 403b. This basically means that if you have access to a 401k and a 457 plan, you can max out both accounts. Most people who might have access to a 457 have no idea that they can do this or that they even have access to a 457. I know two physician assistants who both work for public hospitals and both of them only recently discovered that they could contribute to a 457. They’d previously only been maxing out their 403b, costing them extra tax-advantaged savings that they could have had. If you happen to have access to a 457, that’s another $18,500 in tax advantaged savings you can put away. Doing the math, that’s $18,500 from your 401k or 403b, plus $5,500 from the Roth IRA, plus $3,460 from the HSA, plus another $18,500 for the 457. 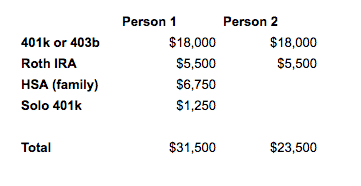 If you’ve got all of these accounts, you’re now sitting on $45,950 in tax-advantaged savings. A household with access to all of these accounts is looking at putting away an astonishing $91,900 – almost double the median income in the United States. 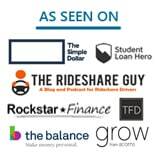 One of the lesser known benefits of starting up a side hustle is that, by doing so, you gain access to bonus tax advantaged accounts that other people don’t get to have. There are basically two types of self-employed retirement accounts that matter for our purposes – the SEP-IRA and the Solo 401k. I’d recommend the Solo 401k simply because it avoids any potential issues with backdoor Roth conversions. Any money in your SEP-IRA counts towards the pro-rata rule and will make backdoor Roth conversions much more complicated. Obviously, very few people are going to be able to put away $55,000 into their SEP-IRA or Solo 401k. You’d have to make well over $200,000 per year in side hustle income in order to achieve that feat. But, considering how easy it is to side hustle these days, most people should be able to make a few thousand dollars over the course of the year. Even a lowly Uber driver or bike courier like myself can shelter much of that income into this bonus tax advantaged account. Someone making use of all of these accounts is looking at putting away a staggering $100,950. Obviously way easier said than done. This family could save a ridiculous $197,750. You’ll notice that throughout this exercise, we haven’t even discussed employer matching. If we take that into consideration, many people should be able to add another $5,000 or so to their tax-advantaged accounts. If you’re a government employee, you might also have access to a pension. My government job required me to contribute 5.5% of our salary into a defined contribution pension plan. My employer threw in 6%. This was additional tax advantaged savings that didn’t count towards any of my other contribution limits. You could also consider a 529 plan as an additional tax advantaged account. If you happen to live in a state that offers a tax deduction for 529 contributions, all the better. I personally think of 529 contributions as separate from the tax advantaged accounts talked about here. How Much Can You Realistically Save In Tax Advantaged Accounts? Realistically, very few people are going to be in a situation where they’re able to fully maximize all of these accounts. However, I think many people can save way more than they think. We already saw that most people can utilize their 401k, Roth IRA, and HSA without much additional work. Combined, that’s over $50,000 in tax-advantaged savings for a normal household. It wouldn’t be that hard to add an additional $1,000 or so in tax-advantaged savings through side hustling. This household is putting away $55,000 per year in tax advantaged accounts without having to do anything particularly extraordinary. I know a physician assistant couple that could definitely pull this off if they tried. Any couple able to do this would easily be millionaires in just a few years. It’s pretty shocking to think that it’s possible to save nearly $200,000 in tax-advantaged accounts. Obviously, very few households are going to be in that position, but it’s interesting to see what is possible. What’s more interesting, though, is the fact that most professional households should be able to put away over $50,000 in tax advantaged accounts without having to do anything particularly out of the ordinary. If you’ve got a little bit more drive, you can throw in some side hustle income and save even more money each year. With a median household income of around $50,000 per year, most professional households can essentially save the equivalent of one family’s yearly income every single year. It seems like the government wants you to save money, especially since they give you so many ways to do it. You just need to do the work and figure out how to take advantage of those opportunities. If you are a high roller owning a business, you can open a defined benefit plan. I think that the current limit that it can hold is $2.3 million. This is sort of like a pension plan. However, most of us aren’t going to benefit from it unless your financial situation falls under its restrictions. Holy crap really? That’s pretty nuts. Probably not something most of us could do. But maxing out all of these accounts is potentially possible. Imagine a doctor (like yourself) with access to all of these employer-sponsored plans maxing out all of these accounts. Then imagine that doctor (like yourself) runs a successful blog pulling in over $200k a year. Totally doable considering there are bloggers out there making literally a million a year blogging. 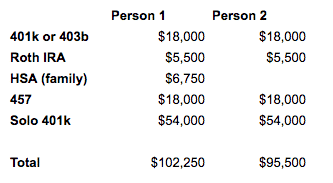 Seems not so far fetched for one person to put away nearly $100k in tax advantaged accounts just by themselves now. Most employers never offer all of these options, unfortunately. If you work for yourself, you can get squirrel away more earnings. However, many medical professions are also not conducive to self-employment. Don’t many docs work in hospitals that would have a 403b and a 457 plan? I know two PAs that work at a hospital and have both. I always thought that medical professions could actually do self-employment pretty easily on the side through locums work. Isn’t that 1099 income that you can save away in a self-employed retirement account? You’re right. Many doctors are hospital employed and have those options. Many hospitals are for-profit, and only have 401k with hardly any matching (I’ve seen some without matching). Other doctors are simply employees of medical groups that also have nothing outside of a 401k plan (myself included). Locums work (http://smartmoneymd.com/how-to-become-a-permanent-locum-tenens-physician/) is possible for many doctors too, but you have to be in the right specialty. I work about 60+ hours a week not including on call or the extra ~5 hrs of meetings/administration I do. No energy to locums, and I’m also prohibited from doing outside work in the same area as a restrictive covenant too. The bottom line is that there is always a way to structure your career to maximize your financial benefit, but you have to be relatively astute early in your career and know what you want in a career. I was uneducated in financial terminology until after age 30, when my career path was essentially set. Totally agree, most people won’t be able to go all out on these. It’s just interesting to see what could be done in an ideal situation. Most people assume that all their is is a 401k and an IRA, and then, most people don’t even use those avenues. If you build up $3,400 per year in an HSA, how could you use this money for early retirement if you’re only allowed to withdraw it for medical reasons? I’ve heard about early retirement folks loving the HSA, but I don’t understand how money wouldn’t get stuck in the HSA. It’s a good point and to be honest, I’m not sure. I think the idea is that, you’ll definitely have medical expenses at some point, so that gives you an avenue to cover those expenses since you can just withdraw that at anytime. In addition, if you’ve got a chunk there, presumably you can withdraw a little bit more heavily from other accounts since you’ll have a large chunk of money sitting around for you when you get older. Just my thought anyway, I could be wrong. Thanks for the reply, FP! I think you’re right, especially considering we typically have more medical expenses as we age. My department is currently in contract negotiations. I’m advocating some employer matching for our 457. I think it’s genius because it’s still money for the cops AND fits in with City Hall’s focus on making cops more retire-able without bringing up the dirty “pension” word. Unfortunately many in the union think I’m crazy. Oh well. Would be nice to snag that. Interestingly, it looks like matching in a 457 actually reduces the amount you can defer, so you can’t actually go above the $18k max. Not sure what other retirement options you have, but may want to advocate for matching in those areas if possible. As a cop, how many tax-advantaged accounts do you have access to? I’m thinking it must be more than most people. I would be fine with that, I already max out, so some matching there would free up dollars for me elsewhere muhuhahaha. 4) Mandatory Retirement Health Savings Account. – 1% of salary. Any side gig opens us up to all the excellent opportunities in your article. If you ignore the siren song of spending big, there is plenty of opportunities for strong savings. Unfortunately many of my brethren get distracted by the need for multiple girlfriends, boats, RVs, campers, etc… it’s all gravy until the overtime dries up or the divorce hits. ???? You’ve got a similar situation to me in that it looks like you don’t have a 401k or 403b at work, and instead, only have a 457. The great thing in that situation is you can basically put away all of the side hustle income you earn into a Solo 401k. Basically, create your own 401k! Nice summary, FP. I’m a big fan of the self-employed retirement accounts… mainly because of the high total contribution limit of $54k. With a 401k, you’re really at the mercy of the employer in terms of any match or additional contributions. I’m pretty fortunate in that I’m considered self-employed with my physician group, so I can stash away $54k a year. We also have a defined benefits plan where we can put away up to an additional $30k a year. That’s a huge benefit to be able to put away so much! I think you incorrectly doubled the “employee contribution” in the 401ks. I believe the IRS has a max of 18k for emploYEE contributions across all 401ks. If you’re referring to the 401k and 457, those have separate contribution limits. If you’re referring to the two 401ks in my example above, those are for two different people, such as two spouses with a 401k (i.e. each spouse would put 18k into their own respective 401ks). If you’re referring to the Solo 401k contribution limit, see the example provided by the IRS. It would appear that you can contribute $18k into your employers 401k, and still make an “employer contribution” of $54k into your Solo 401k. Am I missing something? Regarding the solo 401k, as per the IRS example, if you max out $18,000 in your employer (W2 wage) 401k plan, you cannot contribute any more “employee” (1099) money to your solo 401k. You can make and employer contribution to yourself but only up to about 20% of the adjusted 1099 income. You’d have to make an astounding amount in your side hustle to get $54000 in there. No doubt, it’d definitely take a ton of money in order to pull this off. 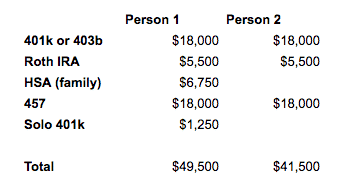 You’d have to make well over $200k in 1099 income per person. Then again, it is conceivably possible and I think I can name some bloggers that probably could pull that off. You actually missed another option. With both people working you can do 5k tax free into a dependent care fsa to pay for day care. Then take that money at end of year and invest it. Functionally you’d have a vehicle more advantages then a 401k since returns are taxed at cap gains rates. Interesting. Thanks for letting me know! I didn’t even know about that option! Great article!!! I’m not quite there yet but when my father in law was thinking about maxing things out we talked about maxing out his SEP vs. setting up a pension. Yeah, I never even knew setting up a pension for yourself was a thing. Seems pretty baller actually if you’re in a position to do that! Fantastic list! It’s amazing how much you can save if you’re smart about it. I just started with an employer that allows me to have an HSA, so I’m socking money away with that — and just paying all of those bills out of pocket (to withdraw later). This year’s plan is to start a SEP-IRA, so if you have any suggestions on the best place to go for that, keep me posted. And congrats on the new government savings plan — I had never heard of that, but it sounds worthwhile to take advantage of. Great post — now we just need to get people motivated to save. Thanks, Rob! For a SEP-IRA, I’ve personally had experience with Wealthfront. I prefer going with a Solo 401k based on my own situation, but I did open up a SEP-IRA in 2016 in order to defer some of my side hustle income in 2015. Wealthfront isn’t a bad option because they’ll manage your first $10k for free. Since most of us probably aren’t earning enough in a side hustle to put away more than a few thousand into a SEP-IRA, I think Wealthfront is fine to start with for 99% of people. I literally opened up the entire account on my phone in just a few minutes. Once you start getting money in there, you can just roll it over into a different account if the management fee worries you. We’ve been maxing out our 401(k) contributions for a few years now along with maxing out our HSA. 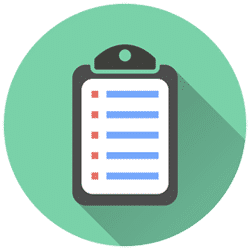 Our income is too high for the tax advantages of a Traditional IRA and we can’t contribute directly to a Roth IRA either, but we may need to investigate the back-door Roth IRA option. The amazing thing with side hustling is that you can open up a Solo 401k if you have any 1099 income. Most people don’t realize that “lowly” Uber drivers and Postmates delivery people can put away a portion of their earnings. I’ve personally never done a backdoor Roth before, but my friend Physician On Fire has a tutorial detailing his backdoor Roth for this year. Just remember that if you’re thinking of the Backdoor Roth, you’ll want to make sure to keep all of that pre-tax IRA space “empty” (i.e. you should have nothing in your traditional IRA or SEP-IRA). Otherwise, your ability to make backdoor Roth contributions will be heavily impacted. I’m pretty new to this whole FI universe, but there is something I keep scratching my head about…If you plan to retire in your 40s, is it wise to max out your tax-advantaged contributions knowing that the bulk of that money will be unavailable for a couple of decades? Let’s say you’re making around $100K per year, what would be the appropriate amount to sock away in retirement accounts vs. regular investment accounts to ensure you have enough money to live off in both stages of ‘retirement’? I assume you would want to figure out what your retirement balance should be at a given point of time to grow to $X once you reach ‘official’ retirement age, but how would you go about doing that. Maybe you can do a full post on this scenario lol? It’s a good question. There are basically three ways to do it. A Roth Conversion ladder. A 72(t) early distribution. Or you could potentially just take the penalty. Mad Fientist has a great article in which he describes how to do all this, available here. You might want to mention that a government 457 is far different from a private 457, where your contributions count as a loan to the company and are available to creditors. 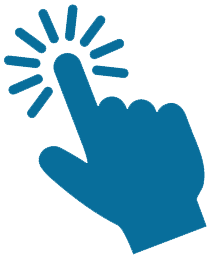 Caveat emptor…. Good point. I’ve mentioned this before in other posts, but it’s a good reminder. When I had a 457, it was a governmental 457, which made it subject to the exact same protections as my 401k. From what I’ve seen, most organizations with 457 plans do seem to be either governmental or large non-profits (like hospitals), where I’d argue that risk of going out of business is fairly low. Obviously, health of your employer is something to consider though.